Earn up to 16% per year from solar panels, through electricity savings and the Feed In Tariffs. Join the solar revolution and start making money from your roof. Simply enter your postcode below and we will give you an instant estimate of the income you could generate. 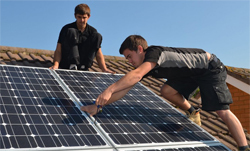 Looking to install Solar Panels in the UK? Search our directory for a full list of MCS Approved Installers in your local area. Solar panels come in a variety of different types and technologies all suited to varying situations and requirements. The two main types of panel are differentiated by their output of either electricity (solar PV) or hot water (solar thermal). Solar power has been harnessed for many years but only in the last years has solar technology become economically viable for use in the domestic household. Solar thermal can provide hot water all-year round whilst solar PV can cut up to £200 off your energy bills and provide a passive income via the Government's Feed-in Tariff.